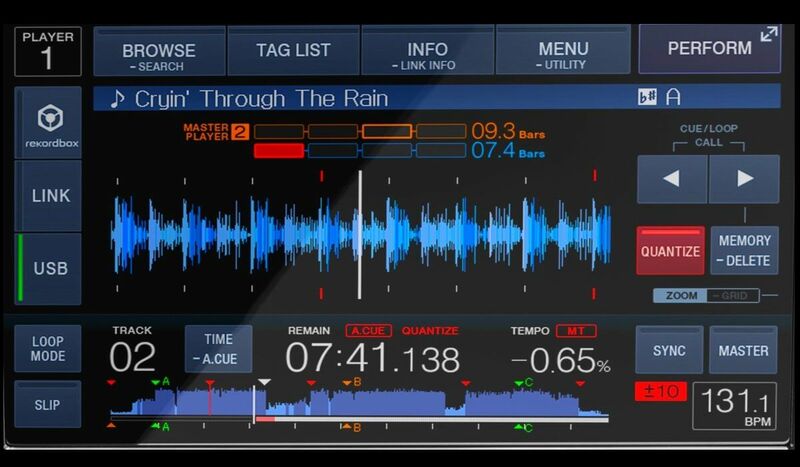 Bottomline: The XDJ-700 is an excellent introduction into the XDJ/CDJ world. The “piece of resistance” is the central screen, big, bright and touch-enabled. 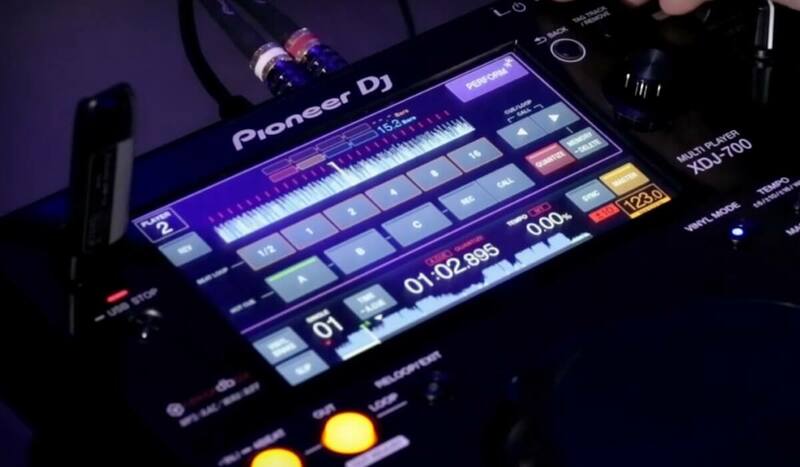 It gives access to most of the functions of the XDJ-700, as physical controls are limited. 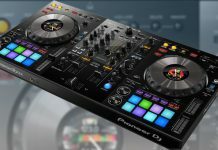 The XDJ-700 is not the same size or height as the other XDJ/CDJ media players, so Pioneer DJ provides a stand in the box that clicks on the bottom of the player and brings it up to standard club mixer height. 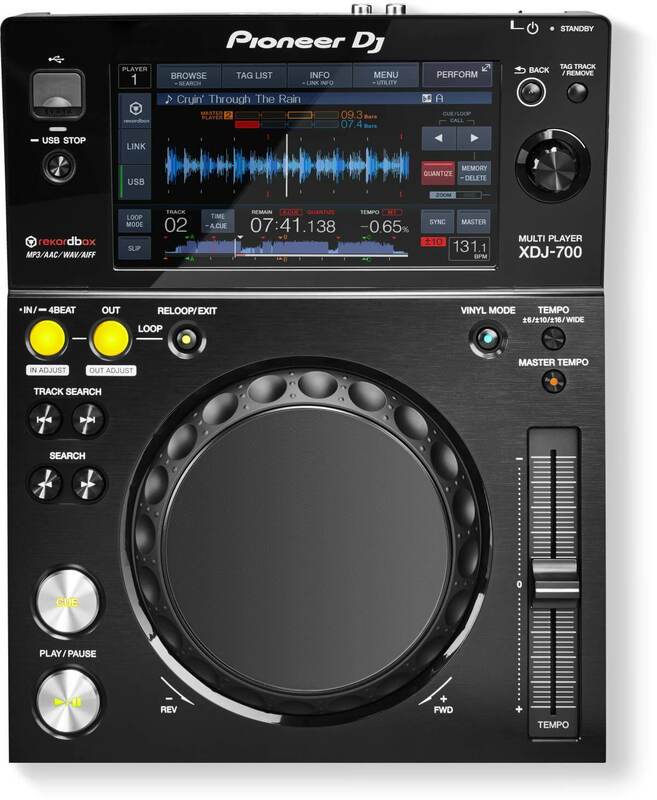 Let’s look a bit deeper at the different functionalities of the XDJ-700. Although that many of the features of the XDJ-700 need to be accessed from the screen, there are still a few physical knobs & buttons to play with. The cue buttons are still there, track search & search, play/pause & cue buttons very much like on the other XDJs/CDJs, a nice long pitch fader for accurate beat matching. 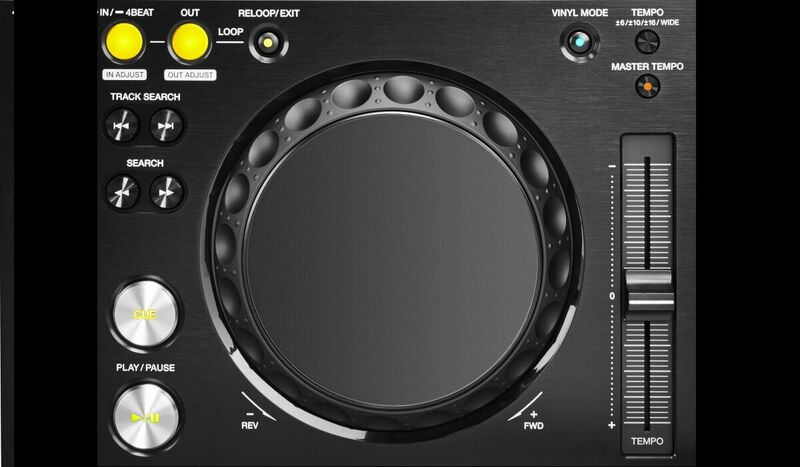 Finally, there is a vinyl mode button, tempo (to set the range of the pitch fader) and a master tempo button. The jog wheel is mechanical, much like the one other Pioneer DJ media players. The difference is that this one is smaller, and it lacks any type of LCD screen in the center. The size of the jog on itself is not a problem to me, neither are the weighting or the overall feel. 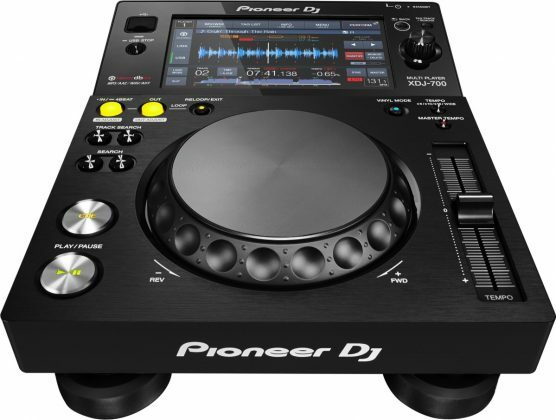 I do find it a pity that Pioneer DJ decided to mount a basic jog wheel on a USD 700 player. 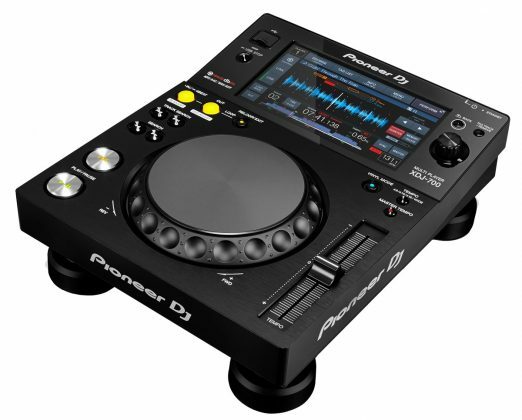 I feel that a jog wheel similar to the one on the XDJ-RX would be a better choice here. The cue buttons are still there, track search & search, play/pause & cue buttons very much like on the other XDJs/CDJs, a nice long pitch fader for accurate beat matching. 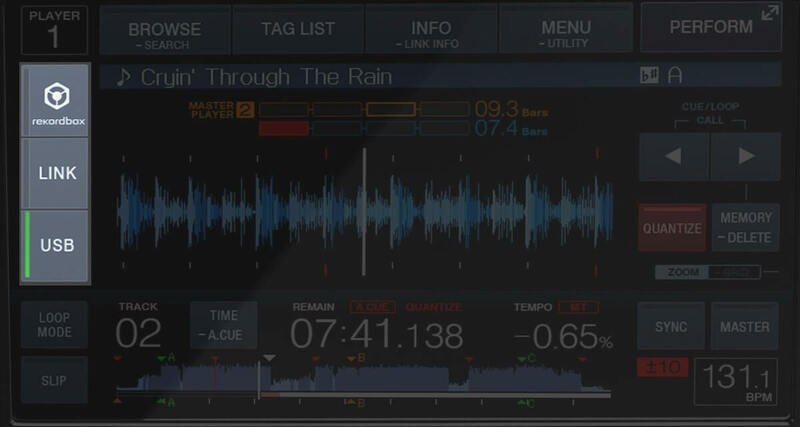 Finally, there is a vinyl mode button, tempo (to set the range of the pitch fader) and a master tempo button. In sum, it feels and looks like a traditional CDJ, so for those DJ’s interested in the XDJ-700 as their home use setup, this is important, as the experience will be close to the one they would have in a club on a pair of CDJ-2000NXS2’s. The touchscreen is 7 inches in size, full color, and touch-enabled. This means that in good lighting settings (such as a dark venue) the information is clear. The responsiveness of the screen is important since it is the main interface to access the player’s performance features. I can say that the screen is quite responsive and launching loops and hot cues from it didn’t pose a major issue. Still, physical buttons are the interface of choice. A touchscreen is no match for performance pads, and tactile feedback technology needs to advance a lot for it to offer a comparable experience. The screen offers access to your music in 3 different ways. LINK: link multiple players together to use the same USB device as the source. You can link up to 4 players using a LAN cable and if needed a Hub. Rekordbox: In Rekordbox mode the players access a remote Rekordbox library on a laptop, or they are connected through USB (HID mode) to the computer and controlling Rekordbox DJ (if you have the required license). I tried the player in USB mode and in Rekordbox mode (connected to Rekordbox DJ and the player acting as a midi controller). For me, the player performs best in standalone mode playing from a USB stick, but acting as a midi controller controlling Rekordbox DJ was not a bad experience either. Check the video below on how that played out. The XDJ-700 in performance mode is when the player really shines. There are a lot of functions to cover here so let’s review the main ones. On the bottom left of the screen, there is the slip mode. When the player is in slip mode you can, for example, scratch and the track will just continue to play underneath, perfectly in sync. When not in slip mode, the beat loop buttons activate loops of a pre-set size, between 1/2 beat and 16 beats. The arrow buttons on the right side allow you to change the size of the engaged loop. When in slip mode, pressing the same buttons engages a roll, while the track continues to play. the hot cue buttons engage hot cues, and it is possible to set hot cues on the fly while playing by pressing the REC button. The responsiveness of the screen is great, and playing around with cues & loops feels quite natural. Not nearly comparable to having physical buttons of course, but workable. 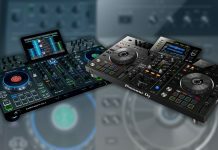 Being an entry-level player, the XDJ-700 only has basic connectivity. On the back, there is a stereo RCA out, an ethernet port for the LINK connection and the USB output. So no digital out here. The LINK connection allows hooking up a maximum of 4 players together to share 1 music source. 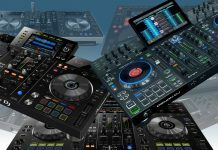 So is the XDJ-700 an interesting buy? You bet it is. For less than USD 700, you get a feature packed Pioneer DJ media player with functionalities that until now were only available on high-end players costing thousands of dollars more. If you can live with the lack of a CD player (and my conviction is that only a few DJs can’t), and with an entry-level jog wheel, the XDJ-700 is pretty much a lock.